Many know Kimberly Williams-Paisley as the bride in the popular Steve Martin remakes of the Father of the Bride movies, the calculating Peggy Kenter on Nashville, or the wife of country megastar Brad Paisley. 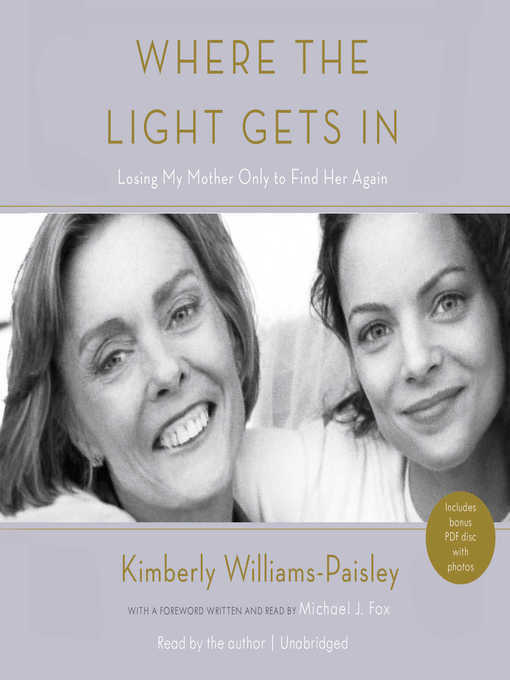 But in 2014, Williams-Paisley revealed a tragic secret: her mother had been diagnosed with a rare form of dementia called primary progressive aphasia at the age of sixty-one.In Where the Light Gets In, Williams-Paisley tells the full story of her mother's illness, from diagnosis through the present day, drawing on her memories of her relationship with the fascinating, complicated, and successful woman who raised her so well. She describes educating herself on her mother's condition, letting go of the shame and secrecy that surrounded it, and finding unexpected humor and grace in a terrible situation. Her book also chronicles the ways in which her family's bond was strengthened by the experience, to becoming an awareness advocate, to accepting the woman her mother has become. It is a heartrending and inspiring reminder of how unbreakable our relationships with our mothers are. Michael J. Fox - Author of introduction, etc.